A whole lot of crunch in a wholegrain munch!. Baked not fried. 80% wholegrain. High in fibre. No artificial colours or flavours. Suitable for vegetarians.Crunchy savoury wholewheat sticks Totally Original Entertain your senses! 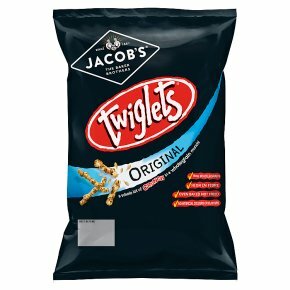 Only Twiglets give you that distinctive knobbly shape, combined with a zingy taste & crunchy bite for all round sensual satisfaction It's all in the way we make it... We bake it for a light & crunchy bite! Great for Sharing! With friends! At parties! In your home! Or on the go!